Fully automatic process chain of robot cells for polishing the inner side and the shell surface of hollow-ware. Tool and workpiece changes are performed as a completely automatic operation by a total of 33 fully interacting and integrated robot systems. The intelligent interaction of the cells and allocation of production steps result in a highly flexible and efficient operation – even for small production runs. An integrated Industry 4.0 interface with IP-based protocols means that the system can be controlled and monitored from anywhere in the world. The system is already in use for production operations at WMF in Geislingen (Germany). 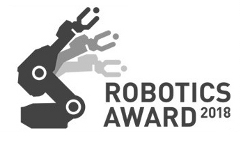 The robot plant has been awarded top prize at ROBOTICS AWARD 2018 at Hannover Messe. For more information see the article 33 networked robots polish cookware to a mirror finish.